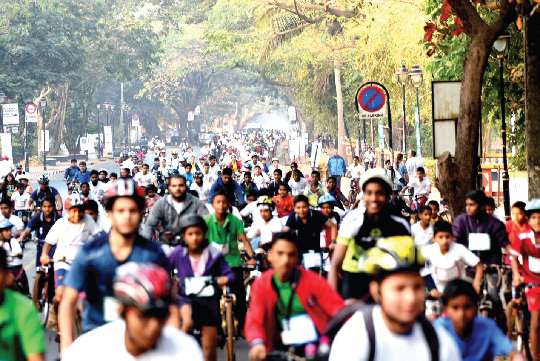 It was a lively confluence of people from different places, occupations and age groups, as over 400 enthusiastic cyclists from across the State participated in Goa’s first of its kind HDFC Bank City on Cycle 2019 Panaji heritage cycle rally, an initiative of Fomento Media, in Panaji, on Sunday morning. The 10-km Panaji city heritage cycle ride began at the SAG grounds in Campal at about 7 am with a lively Zumba session by Zin Willma and her team. The cycle rally was then flagged off at about 7.30 am by HDFC Bank Cluster Head Neville Noronha, Goa State Council for Science and Technology Member Secretary Deepak Parab, Fomento Resources Director Joe Louis and Bhangaar Bhuin Editor Damodar Ghanekar. The cycle rally was led by noted historian Prajal Sakhardande, who took the cyclists across 18th June Road, Church Square, Rua de Ourem Creek, Bhatlem, St Inez, Tonca, Caranzalem and Miramar, explaining some historic spots along the way. Various facilities and arrangements, including refreshments, traffic wardens, 108 ambulance, Goa police and volunteers, were made to ensure that the cycle rally took place in a smooth and safe manner. The hour-long rally culminated with the enthusiastic cyclists returning to the SAG grounds and welcomed to a rousing reception by a large crowd at the venue. Each participant was then presented with a medal and certificate, while also receiving a sipper, T-shirt and snacks. Stalls were also set up at the venue by Food Mate, Hope, The Glow Co., Dhairyansh Green, Wada Wow and Quilts Craft. The Rituals Live Band then treated the cyclists and the crowd to some lively and foot-tapping music, while DJ Tushar also kept the crowd entertained. Illusionist Clifford Parakh conjured up several tricks and kept the crowd mesmerised by his performance. The highlight of Clifford’s performance was his accurate prediction of the main news in Sunday’s edition of The Goan. On February 6, Parakh had predicted that the main news of The Goan would be BJP President Amit Shah addressing a huge crowd and he had recorded his prediction in a sealed envelope. The sealed envelope containing the main news was then opened and read out at the rally, which proved to be correct. On the occasion, several spot prizes were awarded to cyclists and one of the highlights at the City on Cycle 2019 rally was a lucky draw and the winner, Palash Yashwant Dhuri of Porvorim, was awarded a cycle. The City on Cycle 2019 received widespread acclaim from cyclists and the crowd, with many expressing their appreciation of the event.